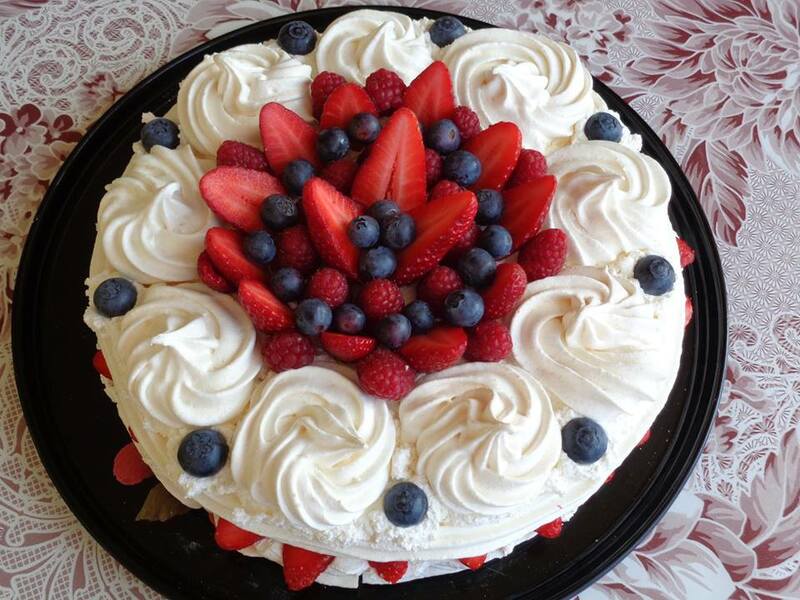 My interpretation of Pavlova cake with raspberries and blueberries, because I think that they are the most suitable for the season. You can make the recipe of a big layer, 2 separate or 3 as I did in the case. In the original, the recipe is with cream of broken cream. But I used mascarpone and sour cream. 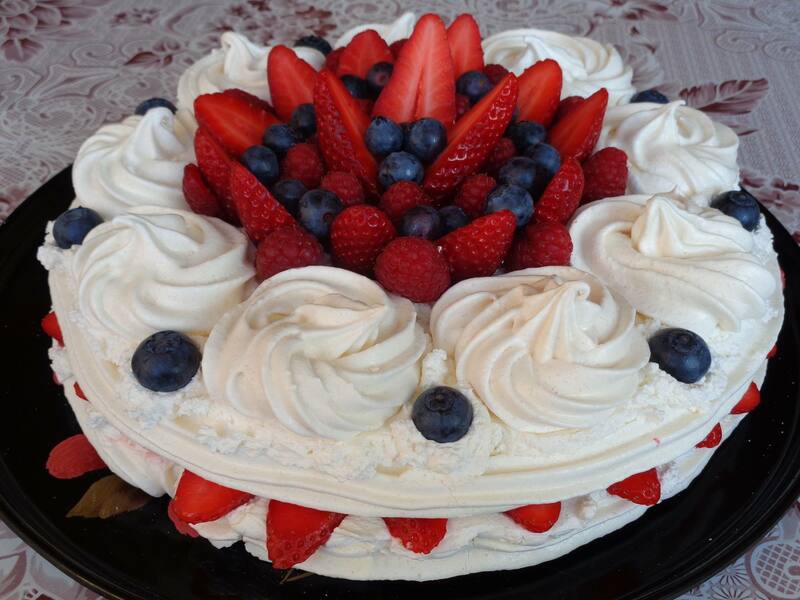 You can also mix mascarpone with cream, you will get more air cream. Everything is a matter of your point of view and a dose of imagination. The blossoms between the raspberries are from edible small violets that blossomed quite casually in a pot on the terrace. Summer is a favorite season for me not only because of the warmth, the sun, the late bedtime and the late getting up, but also because of the abundance of fresh and delicious food picked directly from the garden. Raspberries are one of my favorite fruits. In addition to kissing the rest of the protein blend, this dessert is incredibly easy when guests come home. You buy 2 packages of ready kisses, mascarpone, cream and raspberries. Chop the kisses of large pieces in dessert cups, put mascarpone cream and cream inside, decorate with raspberries, add some chocolate pieces and you are absolutely ready. It’s even easier than tiramisu, which I cook for 7 minutes. I will definitely serve the cake in glasses the next time, as I think it will be pretty spectacular and very beautiful. The nice thing about the cake is that you do not need cake or special ring shapes. You outline a circle 20 cm in diameter (I used a plate of this size), turn the baking paper and put the mixture on the paper. So, I’ve outlined the important steps you need to follow when breaking down the proteins. Do not forget them so you do not have to run to the new egg carton store. Divide egg whites. With egg yolks, you can make cream creams or other desserts. For this recipe we only need proteins. In a metal or glass bowl, put the proteins at room temperature. Turn on the mixer at a low rate and start crushing them gradually until good foam is obtained. Start adding the crystalline sugar a little bit, and increase the speed of the mixer. When the mixture becomes shiny and sticky you can add vinegar. In many recipes, starch is added, which together with vinegar gives the chewing taste of the kiss, but due to lack of starch I missed it. I did not find any particular difference, so if you can not, you can also skip this step. Stir well until the vinegar dissolves well. Divide the mixture into 2 or 3 equal parts depending on how many layers you want to get. Draw a circle 20 cm in diameter and use the spatula to put the mixture for the first layer. Turn on the oven to warm up to 175 ° C with a fan. It is mandatory to bake with a fan as if you turn the oven on another program, the layer itself can be baked from above or below and inside it is still sticky and raw. If your oven is strong, the edges will turn red. Put the tray in the oven, if you have 2 gratings, you can cook them at the same time. Reduce the oven to 125 ° C and bake for about 1 hour and 15 minutes, 1 hour and 30 minutes. The layer is ready when easily detached from the baking paper. Repeat the same with the third layer. Allow the marshes to cool in the oven for a few hours with a slightly open door. For the cream – put the cream in the bowl. In order to get a nice cream and it raises when broken, it must be cold. If you’ve just been shopping, you usually do not keep it in a showcase, or at least not everywhere, put it in a refrigerator for several hours, and then break it down with it. Beat it with the mixer until ready. In another bowl, pour mascarpone, sugar, vanilla, add a little bit of cream and stir with a spatula. The cake is good to assemble before serving. Otherwise, the protein wafers will absorb the cream and will become liquefied, and their crispness will be lost. Separate the marshes from the baking paper, put a cream on each layer, sprinkle with raspberries, then again cream, again layer.